In 1987 Dave Liebman joined saxophonist Wayne Shorter, bassist Eddie Gómez, drummer Jack DeJohnette and pianist Richie Beirach in recording Live Under The Sky: Tribute to John Coltrane in Tokyo. The intensity of that performance and the subsequent interview with Mr. Liebman showed the musicians’ unconditional love for the legendary master musician, John Coltrane. Then, it was eminently clear that few tributes to Mr. Coltrane would equal that one for the depth of its homage and its spirituality as well. And while that may be true, the passage of time has intensified musicians’ feeling of loss that also left the world of jazz without its moral compass; its spiritual leader who showed a generation of musicians the way forward. It was left to musicians such as Albert Ayler and Pharoah Sanders, and now Wayne Shorter as well, to point musicians in the direction of the soul of the music and to revive the spiritualism of Mr. Coltrane’s message. But it also pays to remember the work of the ineffable Dave Liebman in keeping music spiritually centred. Should that have ever been forgotten, here is a timely reminder, which also comes as a tribute to Mr. Coltrane: This is the magnificently produced and recorded Ceremony. Although Mr. Coltrane seemed to be moving “eastwards” and seemed more likely to meld his Afri-centred music with that of India, there is a suggestion—especially with this recording—that at some time in his late-period, Mr. Coltrane was also discovering Afro-Caribbean music. His use of conga and batá drummers surely seemed to be pointing in that direction. But why talk only of John Coltrane? Ceremony is primarily Mr. Liebman’s expression; his direction to take. And even if it lasts for one record, it will have left a lasting impression on his music because of the depth to which Mr. Liebman has reached here. There is a remarkable aspect to Ceremony. It is filled with nothing but the melodic presence of Dave Liebman’s saxophones and flute and the force and power of Afro-Caribbean drumming combined with the tumbao of the bass. It is this very intense and concentrated rhythm that throws Mr. Liebman’s mystical melodies into the spotlight. And it is the stark timbres of Mr. Liebman’s magnificent playing that set the tone for the whole album. His undulating volume and unevenly stressed notes make for dramatic shifts not only in volume, but also in tone that herald the implicit pleading in songs such as “Tardes de Lindóia.” These magical moments continue to inform the soaring flute of both “The Drum Thing” and “Danza del Pájaro.” It is the mythic connection between the songs that seems to suggest another possible root that Mr. Coltrane might have developed had he lived to fully explore various musical idioms and metaphors. But these charts are not simply suggestions of John Coltrane’s possible directions. In actual fact they are Dave Liebman’s monumental meditations. The spirited releases of energy in “The Drum Thing,” “Tunji” and “Kulu Sé Mama (Juno Sé Mama)” from Dave Liebman indicates that Mr. Liebman too is Afri-centred in his musical approach. It also suggests that this saxophonist pays more than a fleeting homage to this music; the music of African-American poets of the brass and woodwinds, reeds and strings, piano, bass and drums. And then there is Mr. Liebman’s suite, Ceremony. The nobility of the composition is driven by its heraldic nature. It is celebratory and, oddly enough it also seems to coincide with the spiritualism of Afri-Centric shamanism as well as Christian prayer. Most of all (and this might or might not have been Mr. Liebman’s intention) the music stretches inter-continentally in the direction of Asia in general and India in particular, with that country’s mystical celebration of “Satchitananda”(Sanskrit)—that which is “being, consciousness, bliss”—attained by intense meditation. Remarkably Mr. Liebman’s musicianship speaks this musical language as well. And it is this that brings him incredibly close to John Coltrane, musically as well as spiritually. Dave Liebman’s feel for imagery and poetry is vast and seemingly limitless. His handling of this through his instruments of choice gives him tremendous possibility as he searches the darkness for that “Satchitananda” something that he is likely to find sooner rather than later. This requires method and discipline—something Mr. Liebman has an unlimited store of. His music will become more energised then as his spirit roams the aether of the fourth dimension; the ethereal realm of music that has proved elusive to most musicians but will never be inaccessible to Dave Liebman, a musician who plumbs the depths of the soul, going Challenger-deep to find nirvana of his music or the Afro-Caribbean bliss that is already suggested by the mighty music of this recording. 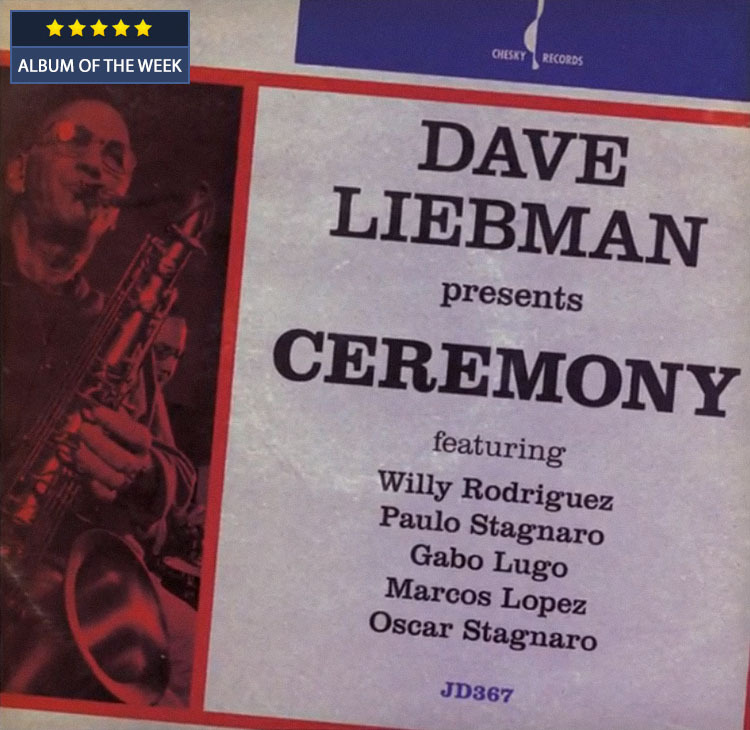 Ceremony is Dave Liebman’s parallel to Carlos Castañeda’s “Ways of Seeing” without the necessary use of peyote for Mr. Liebman’s drug is music; something no one will have enough of after listening to the music of this recording.